Luminescence dating is a geochronological tool used to determine the timing of sediment burial, pottery firing, mountain evolution, mineral formation and the exertion of pressure. The luminescence dating technique covers a large age range from modern-day to millions of years. The technique is inherently holistic, drawing upon understanding from disciplines such as physics (quantum mechanics), mineralogy (grain structure and composition), geochemistry (natural radioactivity), archaeology and Earth sciences. 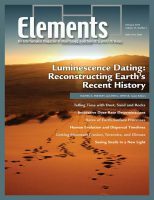 This issue brings together contributions on new and innovative luminescence dating methods and the latest findings related to Earth-surface processes and human existence. 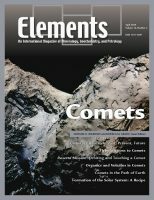 The articles in this issue of Elements provide a fascinating account of comets and the making of our planetary system. We learn why comets are visible to the naked eye, about their complex organic geochemistry, the surprising find of free O2, and the likelihood of a comet impact on Earth. Articles present concise reviews of what has been learned regarding the mineralogy, geochemistry, and geology of comets from the Giotto, Vega, Stardust, Stardust NEXT, Deep Impact, and Rosetta missions to comets Halley, Wild 2, Borrelly, Tempel 1, and Churyumov–Gerasimenko. Processes that force comets to interact with other Solar System bodies are also discussed. The French have a word for all aspects of the wine environment: terroir. Terroir is the integration of all individual factors that contribute to wine quality. 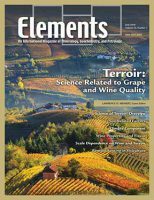 This issue explores the physical environment that shapes the character and quality of wine, ranging from geology and soils to viticulture and climate. It also discusses some of the technological advances such as drones, remote sensing, and precision agriculture that are revolutionizing the production of fine wine. The Central Andes in South America preserve the complicated interplay between tectonics, magmatism, and climate at an active continental margin. This “field-based” issue explores the development of the Andean Cordillera topography and provides insights into magma generation, volcanism, and ignimbrite “flare-ups”. 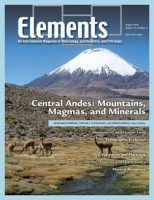 Also explored in this issue are the origins and sources of the spectacular salt deposits in the Atacama Desert and the world’s largest porphyry copper deposits. Deep-ocean mineral deposits are valuable resources for studying Earth processes, including the evolution of seawater and exchange of heat and chemicals between the crust and the oceans. Deep-ocean mineral deposits also represent metal resources that could make a significant contribution to future raw material supply. Exploration for, and potential extraction of, deep-ocean mineral deposits poses many geological, technical, environmental and economic challenges, as well as regulatory and philosophical questions. 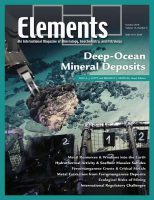 The articles in this issue explore the formation and extraction of deep-ocean resources. The field of marine geochemistry is exploding these last two decades. 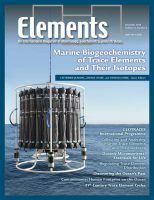 During the 1980s and 1990s, the scientific community developed a geochemical toolbox to study key ocean processes, based on the concentration and isotopic composition of trace elements. The multiple processes at play in the ocean led the community to join forces and combine, at a global scale, the information provided by individual tracers to tackle big questions in oceanography. These were the motivations to create GEOTRACES, an international program of marine geochemistry. The key questions include the sources, internal processes and sinks of the elements; the services and functioning of marine ecosystems; the ocean’s role in climate variability; and the transport and fate of contaminants in the ocean. This issue will introduce the reader to the fascinating exploration of the big questions in ocean science using the chemistry of the infinitely small in seawater.